In addition to other guiding services for winter 2013 we offer now also a great opportunity to learn vital winter travel skills with husky dogs in collaboration with Husky Center Kolmiloukko and their great huskyes! There are two one-week trips with fixed dates but tailor-made trips of similar or different style are available any time in January, March and April. Feel free to ask for dates and prices! Skills for winter travel with dogsleds! Dogsleds are traditional transportation in the Arctic regions especially in the Northern America and Greenland but they work well also in Finland. The trip is a wonderful experience on its own but it also offers good training and experience if you dream on doing a dogsled expedition to Svalbard or Greenland! …or if you’d like to take a skiing trip to Sarek in March. 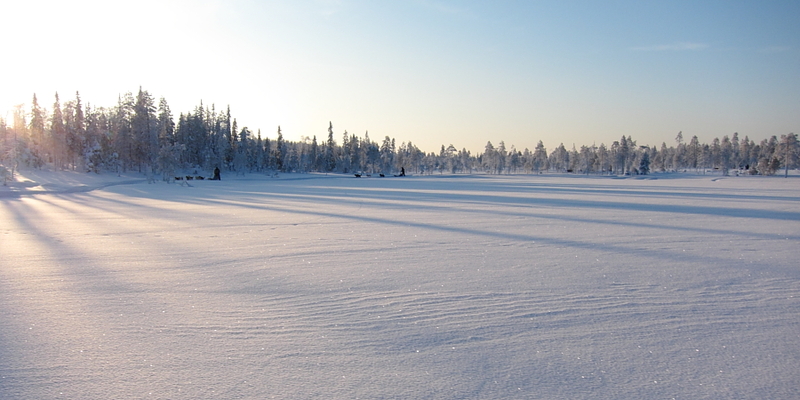 Deep-winter wilderness is a one-week trip to the forested wilderness of Southern Lapland in the dead of the winter. During the week you will learn vital skills needed to enjoy and survive the Nordic and Arctic winter. We will travel three days with dogs learning to take care of the dogs and ourselves, sleep in traditional wilderness huts and snowshelters and have lunch breaks by an open fire in the woods. The trip will continue with two days on skis or snowshoes carrying our own gear and spending the nights in tents in “expedition style”. First and last night in a hotel or cottage. The mid-January offers true winter conditions: daylight is scarce and temperature can be extremely low but the snow covered landscape is beautiful in the soft Arctic light and auroras dance on the night sky. Previous experience is not required. Suitable clothing and a warm sleeping bag are required. (Some equipment available for rent.) The participants must be 18-years old. Underage participants are welcome when accompanied by an adult. Program suitable for 2-6 people. Example flights with Norwegian: Helsinki-Oulu-Helsinki 88,00 eur, Stockholm-Oulu-Stockholm 218,10 eur. Sunny spring crust is a one-week trip to the forested wilderness of Southern Lapland in the warm and hospitable late winter season. We will spend three days traveling with dogsleds enjoying the warm days, spring crust and the beautiful wilderness. 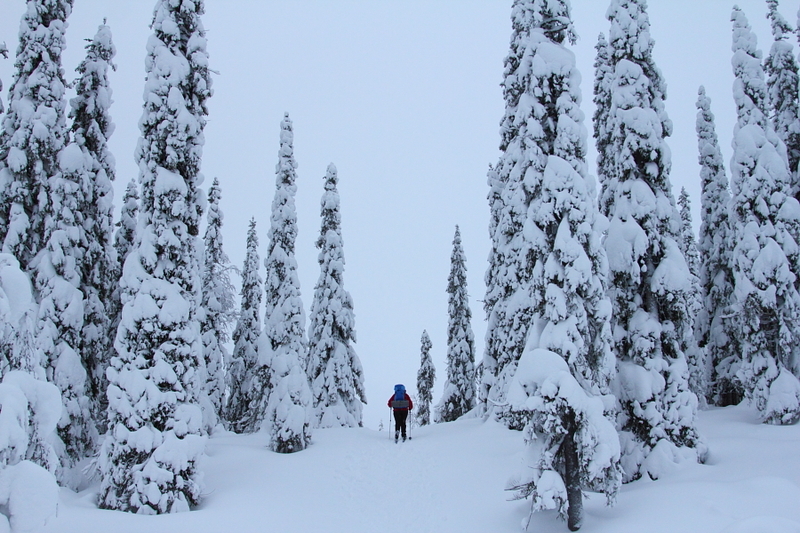 Two days will be spend skiing or snowshoeing in the scenic national parks of the area. Evenings and nights in the wild will be spend in cozy wilderness huts where we will enjoy sauna and hearty dinners. Three nights in a hotel. April offers plenty of sunshine, warm days and comfortable conditions for enjoying the life outdoors. Snow is still plenty and firm “crust” enables easy travel. No previous experience or special equipment required. The participants must be 18-years old. Underage participants are welcome when accompanied by an adult. Example flights with Norwegian: Helsinki-Oulu-Helsinki 76 eur, Stockholm-Oulu-Stockholm 176,40 eur. Ask also for a detailed offers for a tailor-made trip! If you are interested be in touch via e-mail!